26 degrees overnight in April? Check. Tomato plants all tucked in tight? Check, check. We frequently get questions about our high tunnels (also know as hoop houses, or season extenders) and why we have them, what they are used for, etc. Well, this right here sums it up – we can plant delicate vegetable crops (meaning they can’t take a freeze or even a frost) as early as March, even February with our high tunnels. Without a season extender, that would be next to impossible in Kansas. Of course, we do go to extra lengths to ensure our plants survive when then temperature drops below freezing. If it’s going to be 28-32, we put on row covers (pictured above) to give just a little extra insulation. We also stick a jug of water in between each plant at the beginning of each season. On warm days, the water absorbs the heat, and then they slowly let off heat as the temperature drops. Lastly, we fire up the heat when the temp is in the low to mid-twenties. Propane heaters in the high tunnel last night. Wood stove and blowers heating up our other high tunnel (pictured below). This year Gage made improvements to the wood stove in this season extender, and it is much more efficient – we are excited to see what we can keep growing in there into next winter! We also put new plastic on this house. We didn’t open the box with the new plastic in it until the day we were to put it on. We then discovered we had ordered white plastic, which only has 55% opacity. Whoops. However, the white (instead of the usual clear) plastic keeps it from getting overly hot in the high tunnel on sunny days. 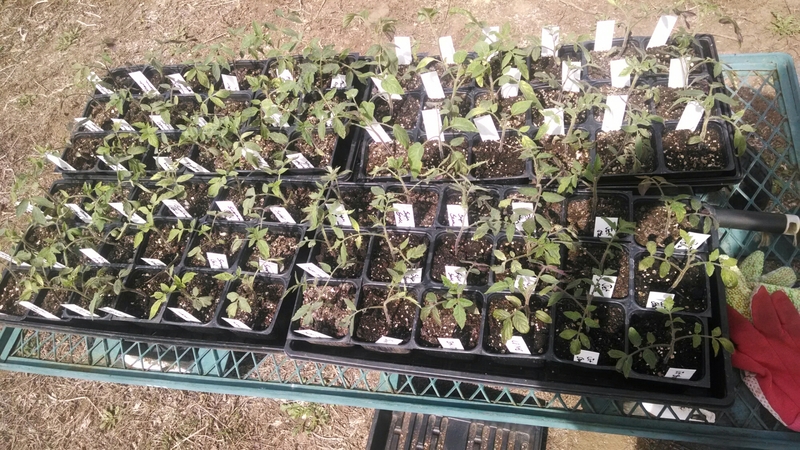 But, we were worried there would be too little sunlight to grow tomato plants. Not the case! Once the plants were established, they have been growing like crazy. Once we are past the risk of frost and freeze, we will roll this plastic all the way up so they will then get full sunlight and rain. So far, ordering the white plastic looks to be a lucky mistake. We were blessed to get our high tunnel funded through the NRCS EQUIP program. Programs like this are a huge asset to small farmers when they are starting out. 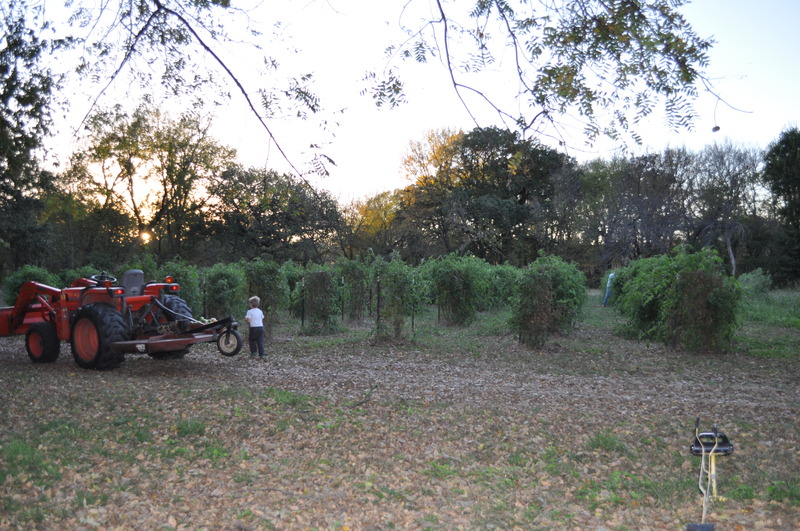 We have worked hard to start and grow our farm without having to take on debt. Programs like NRCS EQUIP help make that possible. We’ve made a lot of progress on our new high tunnel over the past month. Almost all done except the plastic. It takes a dead-calm day at a crew of people to get the plastic on. Now to open the seed catalogs to decide what delicious things to plant in it this spring. It’s official. Tomato season has begun! We picked our first ripe tomato on June 2. JUNE SECOND. The earliest by far that we have every had tomatoes. This is thanks to converting our useless greenhouse into a highly productive high tunnel. 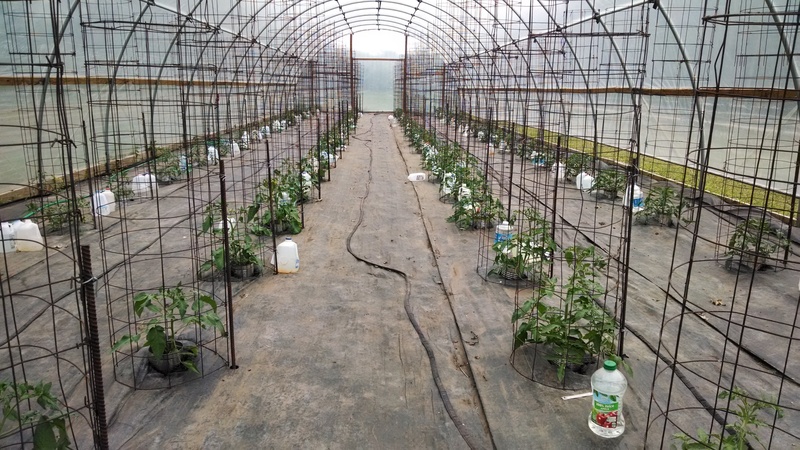 The little bit of extra heat from the wood stove heater in the greenhouse/new high tunnel allowed us to plant tomatoes in late February. The kiddos in the “greenhouse” about three weeks ago. Yeah, it’s a little tight in there. It may or may not be a jungle at this point. Let’s just say, I won’t be posting any more pictures. I will also say, we will most likely rethink our spacing in the greenhouse next year. The old high tunnel is looking good, too. Especially since this is the fifth year for tomatoes in the high tunnel. Yikes. That’s too long to have tomatoes in one spot. These are all determinants, meaning we will get a big crop off of them, and then yank them out. After this year, we have plans to rest a replenish the soil in this high tunnel, and then decide what crops to plant in it next spring. We also have plans to put in another this fall. Look closely and you will see that we have wire along the sides of the high tunnels. That’s to keep critters out. Last year, we had terrible trouble with possums, raccoons, and skunks sneaking in and eating big bites out of each ripe tomato. It was disgusting. This year, we’ve outsmarted them. We hope. The field tomatoes are looking good, as well. 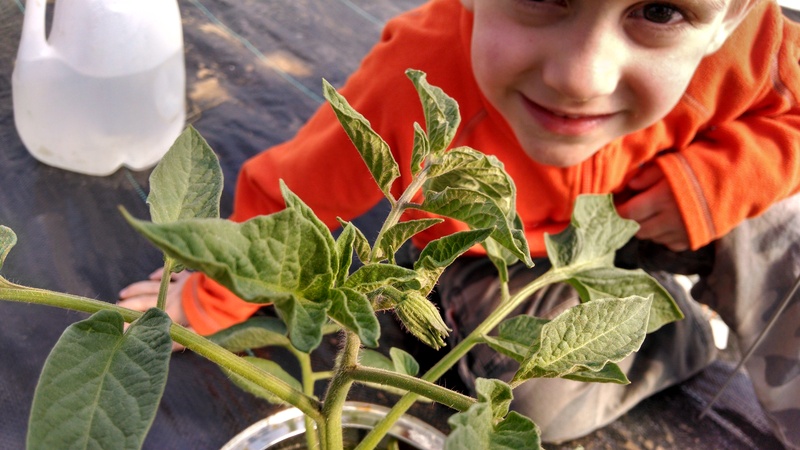 Tilled, mulched, caged, and irrigated – it’s been a busy week in the garden! It’s been a little over a month since we planted those little tomato transplants in the high tunnel. What a difference a month makes! It is been a very mild spring, with no significant temperature fluctuations, and no roly-polys this year. Thank goodness. Our high tunnel has been relatively stress free for the first time since its installation. The plants are thriving, and putting on flowers – it’s awesome to see! The watch is on for the first green tomato. Asparagus season was shorter than we anticipated this year, thanks to two late freezes. But never fear, veggie lovers! Summer veggies will be here before you know it. Planting tomatoes in the high tunnel today. Another season has begun! 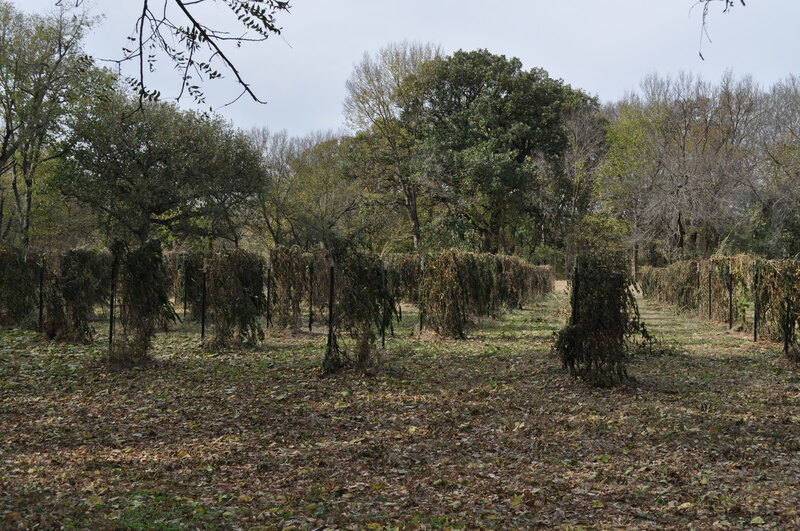 This is what our tomato field looked like hours before the first freeze. … And here is what it looked like the next morning. Good thing we picked all the tomatoes! 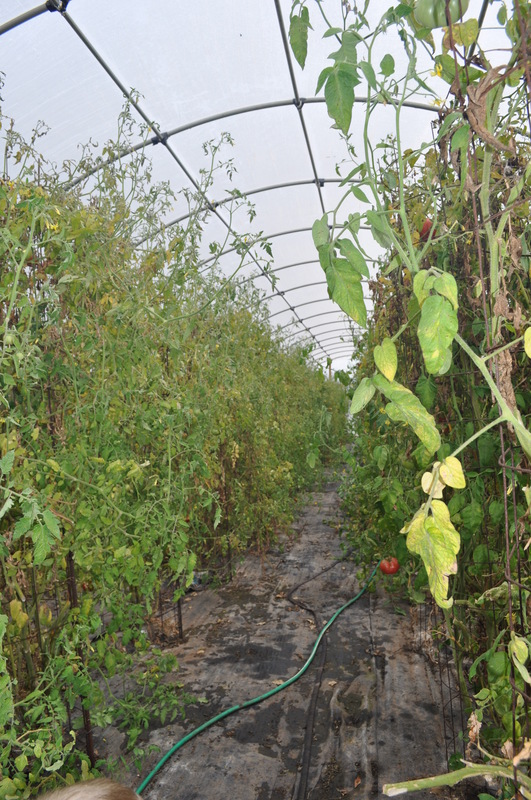 And here is what the high tunnel looked like after it got down to 28 degrees – warm and balmy inside! Amazing! Looks like we will have tomatoes a while longer. 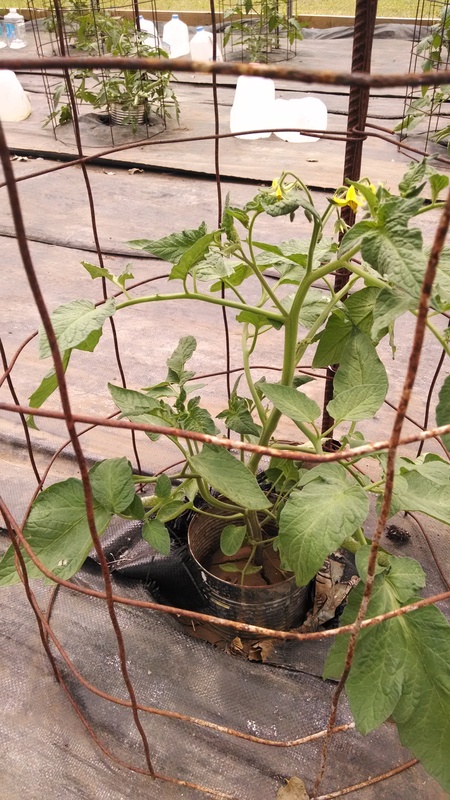 One tiny tomato blossom (not even open yet)! Many more to come … hopefully SOON! and Thursdays in July, 5-7 pm. Or call to make and appointment!